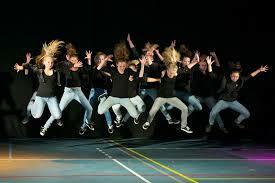 Street dance with movements like popping, locking, krumping and housing is often a global umbrella term, which also belongs the more acrobatic break dance. From this B - boying and / or Breakdancing is the street dance born. It is also called "video dance" or "clip dance". Street dance arose early 80s on the street in the slums of New York. It is a sport where improvisation and encouragement are important by the bystanders. So with a strong social interaction with bystanders and fellow dancers. The dancers wear "baggy clothes" that give them lots of room to move. In Europe, street dance only broke through in the 90s. Video clips, graffiti, DJs, rappers, scratchers are an important part of the culture. In various film they formed the main theme. Under the influence of music videos street dance constantly change. It is usually very fast and modern music like hip hop and R & B dance. A typical movement is the snake, based on the agility of a snake, the body "waving". Street dance is "bouncing on beat", the rhythm is followed strictly. A major source of inspiration from the scene was MC Hammer, as old school rapper known for his dance moves.